The product adjacencies to the walls, and other protruding parts for sealing the interior floors of the roll and mastic materials. Vapor barrier and waterproofing assembly seams at the organization of heat insulation of foamed polyethylene. 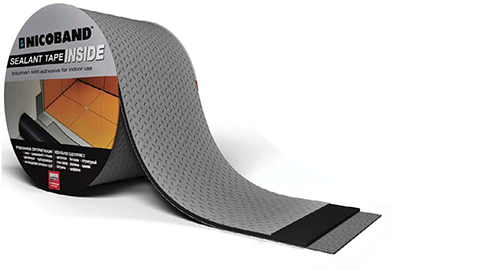 NICOBAND INSIDE is a self-adhesive sealing and waterproofing polymer-bitumen tape. Produced by unilateral application of anti-adhesion to the polymer film self-adhesive bitumen-polymer binder consisting of bitumen, SIS (styrene-isoprene-styrene) polymer modifiers and special adhesive additives. Self-adhesive non-woven polypropylene (Spunbond) is used as a protective layer on the other side. Attached to the dry and cleaned surface. Fit, without any equipment. It is recommended to work at temperatures above +5 °C.